A roast chicken’s personality can change drastically depending on how you season it. Here are 11 ways to flavor your next roast chicken. Truth: A chicken from the farmers’ market is more flavorful that your average supermarket bird. Still, a roast chicken’s personality can change drastically depending on how you season it. Here are 11 ways to flavor your next roast chicken. When you buy one of those $20 heritage, heirloom, buzz-word-laden chickens, it’s best to keep the ingredients as simple as possible to let the flavor of the high-quality bird shine through. Stuff the cavity with peeled garlic cloves, a halved lemon and herbs (like thyme, sage and rosemary); rub the chicken with butter or olive oil and season generously with salt. You’re good to go. For a sweeter, more fragrant take on the Mediterranean-style bird, stuff it with herbs and halved tangerines and drizzle with white wine, tangerine juice and honey. 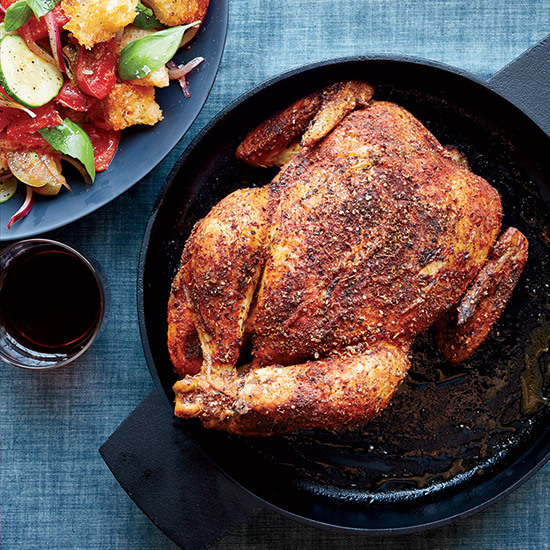 Roast with broth in the pan to create a glazed bird and delicious pan juices. Melt butter with maple syrup and black pepper and brush over chicken during the last 15 minutes of roasting. Be like Mario Batali and rub your chicken with smoked paprika, dried sage and cumin for a bird that tastes like it could have been cooked over an open fire. For a deliciously crusty chicken, toss a cut-up chicken with mustard mixed with soy sauce, white wine and garlic and roast at high heat. Miso adds an extra savory flavor to roast chicken; blend it with butter, parsley, chiles and fresh ginger and rub it on the bird before roasting. For a more sweet-spiced chicken, rub chicken with a butter that’s been blended with cumin, coriander, sweet paprika, cayenne and cinnamon. Add onion, garlic cloves, dates and dried apricots along with some water to the pan as the chicken roasts to create a chunky gravy. For a warmly spiced chicken, rub it with a curry-garlic butter, then add chopped tomatoes, chiles and onion to the pan to flavor the juices. Rub chicken with a butter flavored with cloves and star anise, then brush with a vinegary soy glaze during the last 15 minutes of roasting. Mix softened butter with ginger and garlic to rub all over the chicken. Add onion, garlic cloves, sliced ginger, sliced Serrano chiles and quartered lime to the pan along with some water to create flavorful pan juices. Add some fish sauce to the gravy just before serving. For an awesome roast chicken that hits a lot of spots on the tongue, rub the bird with a butter that’s been blended with garlic, cilantro, mint, ginger, serrano chile, cumin, cloves, black pepper and lime juice. It won’t disappoint.